Initially, there was plenty of frustration and anger, I can tell you! Hopefully our experience can help others avoid the same frustrations. We have quite long grass due to the lack of herbivores grazing on the green winter pastures. The electric fence requires the grass to be short or the strands of wire woven into the nylon will short out and cause the battery in our solar energizer to go flat. To solve this, the grass needs to be very short under the fence, and we use our ride-on mower to achieve this. Initially, the trouble is figuring out where to mow exactly, just the once please! The Kencove fences we purchased were infuriating, since you could not make them square because each side was a different length. The second one we sent back (due to major manufacturing errors) and we would have returned both if not for the fact that the chooks would have been left without any protection at all without one. So, we looked at how to make the Kencove work for us. Firstly, the fences were shipped to us with feet that were manufactured incorrectly. The supplier kindly shipped us new feet and we replaced all the mis-shapen feet with the new ones. A tedious job. Now we can make a nice square in the field, mow, set up the fence and move the chooks in and we're done. Although, the Kencove fence still needs to be pegged down with tent-pegs around the posts as it has large gaps - we think we can solve this by cutting the posts a little shorter. We will give this a try in the near future. 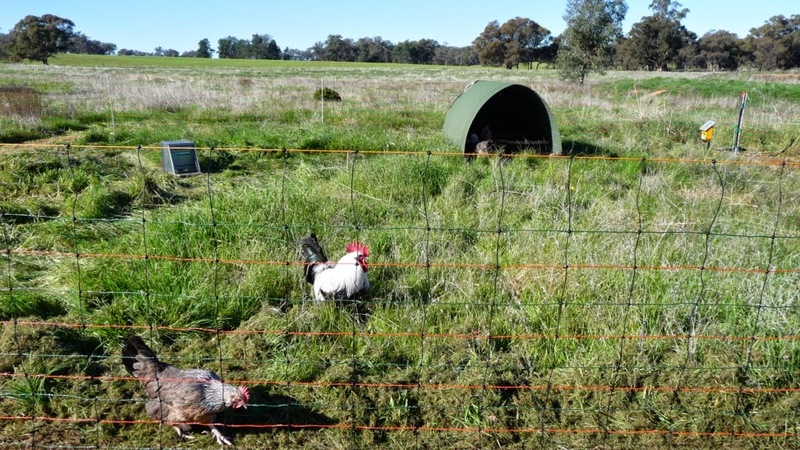 Wanting a second fence to make moving the chooks easier, (we really didn't want another KenCove) Premier One had recently became available in Australia, so we jumped at the chance to get one and see what the differences were and if they are any better. We feel the Premier One is a better quality product, especially the foot design and sturdiness. It just seems a more simple and practical. Oddly enough though it too came with vastly different side lengths and making a square out of it was impossible! So again, back to setting it up in a long line and moving the post to where they should be and even taking one out because there were too many! Bonus Post! Now we have two working fences, but the bonus of the Premiere One is that no tent pegs are required to keep it on the ground - saving us quite a bit of time and effort when setting it up. As for the chooks - they seem to love their new lifestyle. They are moved roughly once a week at this stage, since right now there are only 8 of them. 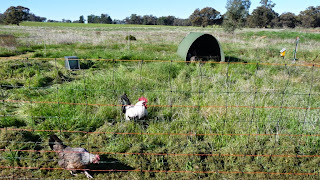 One day they will be part of a leader-follower system where the chooks will follow the cows in rotation, but until then, they're happily scratching away at the grass and weeds.